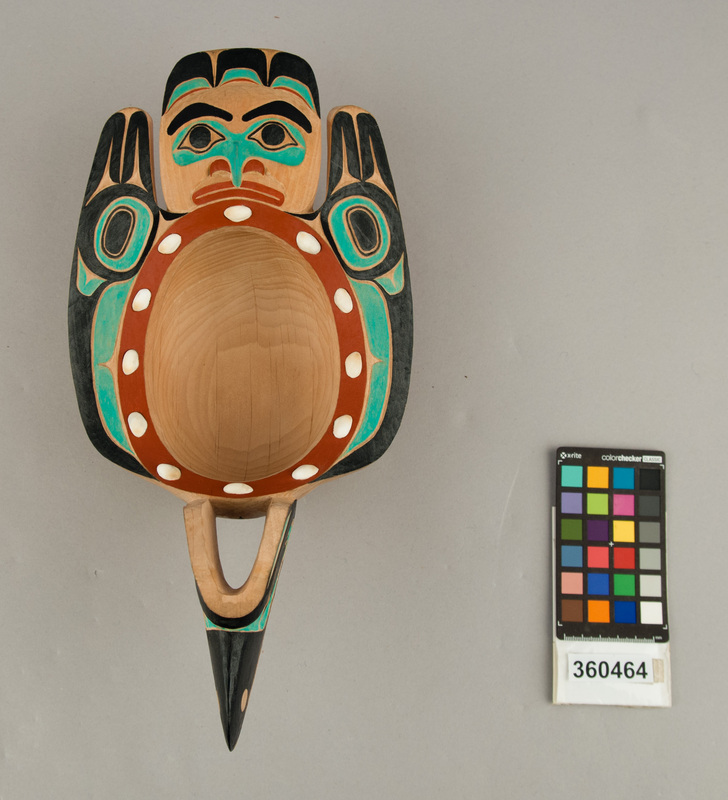 Description: mask, Mask (nijun) of alder. Represents an old wrinkled woman, face wrinkled, grey hair, eyelids movable, abalone ornament in nose (kunstijao), and in ears (giuge). Labret present in lower lip. Face evenly colored with red. "Used in dog eaters dance (shaeda) was made in Massett". Description: mask, Mask (nijun). Carved to represent Dog-fish head, painted in red, black, and green. Of alder. Description: mask, Mask (nijun). Of alder, a face, eye-brows eyes black, a design in red on sides of face and nostrils. Use in 1st dance of potlatch. Description: mask, Mask (nijun). Of alder, large face. Eyes black, ears and parted lips red. Teeth showing. Used in first dance. Description: mask, Mask (nijun). Large face of adler. Mustache and beard, eyes black. Lips (parted) red. A whale on each side of face drawn in red and black. Used in first dance. Description: mask, Mask (nijun). Of adler. Intended to resemble a shrimp (duk). Eyes move by a mechanical arrangement. Ends of tail segments meet on forehead. A median tooth. Description: mask, Mask kaokome. Of alder, small, represents human face, strong lines under eyes. Worn at potlatch by boy. Lips and nostrils red.